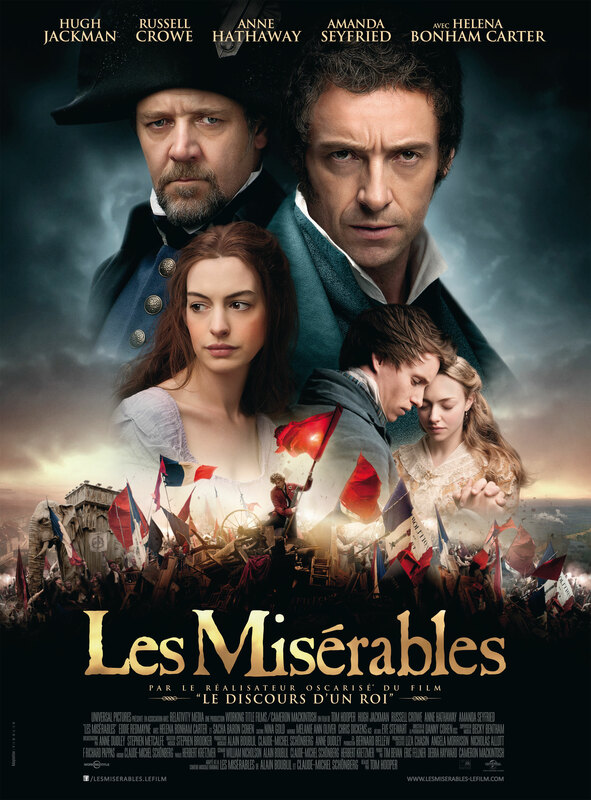 Director Tom Hooper brings his adaptation of the iconic and classic 1862 novel Les Misérables to the big screen. The movie opens with convicts in the sea working, focusing on Jean Valjean (Hugh Jackman) who soon gets released on parole, once free he struggles to find work and seems to lose all hope, when an act of kindness helps him find himself once again he decides to reinvents himself from a petty thief to an upright model citizen. 8 years pass and he thinks he is free from the man he used to be, try as he might he can’t seem to shake Inspector Javert (Russell Crowe), a dogged lawman who hounds him even as he becomes a wealthy mayor. With his new found wealth and position Jean Valjean just wants to help the poor around him, he meets Fantine (Anne Hathaway) who is kicked out from her job and put to the streets where she sells her hair and becomes a streetwalker all to help keep her daughter fed. Emotional, tear-sodden with pure intensity Fantine projects her wounded soul in song ‘I Dreamed A Dream’. Jean Valjean who finds Fantine in the gutters so to speak he attempts to help her, sick from fever and on her death bed he promises to take care of her daughter, and on such promises he becomes a surrogate father to an orphaned Cosette. When Jean Valjean finds Cosette she is in the care of an innkeeper and his wife who treats her like a slave girl, Adding humour to a movie which represents a time of dark depression in Paris, watching how the poor are immersed in squalor, it is a lightened moment when you are introduced to the innkeeper an his wife played by Sacha Baron Cohen and Helena Bonham Carter, they are comical crooks who steal from their customers. bringing hilarity to a serious movie. Still on the run from Javert, years pass by and an older Cosette (Amanda Seyfried) falls in love with a wealthy stranger (Eddie Redmayne ) which in turn brings out the love and hope in this beautiful musical, with delicacy and elegance you witness how a dream can become something. With a star studded cast to bring out the best in this beautiful and inspiring musical, it is without a doubt a heartfelt performance by them all. Personally it is rare that i find myself enjoying a musical, my mind wonders off and usually I am bored within an hour, However I felt touched by this movie, Anne Hathaway is impressive, she truly surprised me with her vocals and I was instantly moved by her performance, Sacha Baron Cohen and Helena Bohen Carter were hilarious, they really brought out an amusing element which just highlighted the fact they are brilliant actors and added that something extra to such a serious musical. So many people were tearful around me and there was even an applause at the end of the film which has never happened before in my cinema experiences. A touching and tearful performance to so many, Directed incredibly by Tom Hooper! it is hard to believe there will be a dry eye in the cinema when you've seen this.